I am teaching my sixth grade students conversions from the customary system (inches, feet, miles, cups, ounces) to the metric system (liters, centimeters, grams) and for these kids it is a pretty hard sell. In my classroom, the metric system is condemned because it is associated with an object of universal hatred: My Toyota. I then explain that Canada uses the metric system and if any of them want to go fishing or hunting there they are going to need to know what a kilometer is. Teaching in the country is full of these kinds of accommodations. The hardest part of teaching the metric system is that most of these kids don’t have any concept of how big a centimeter is, or how far a kilometer is. They don’t have a reference for it. They often make the argument that the customary system is fine; after all, aren’t fractions of an inch small enough? Why do we need to measure anything bigger than a mile? 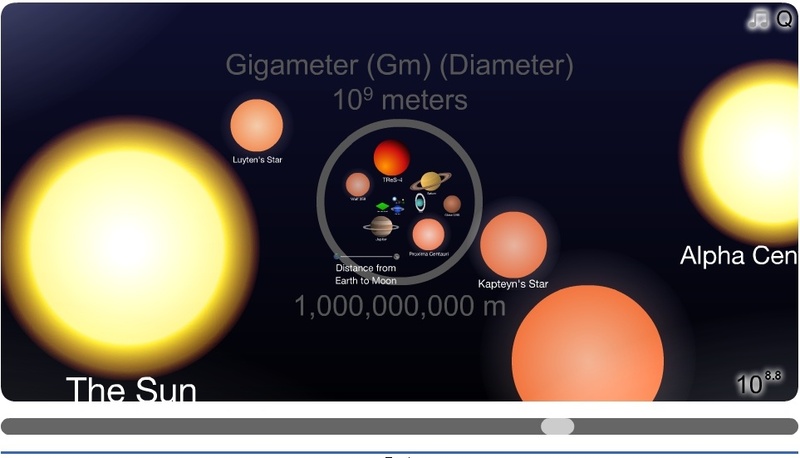 The Scale of the Universe is a neat little Flash app. Zoom in and it shows you the smallest things in the universe—smaller than atoms, smaller than electrons—and their metric measurements. Zoom out, and it shows you humans and animals. Zoom out even further than it shows you planets, stars, and eventually the size of the observable universe. 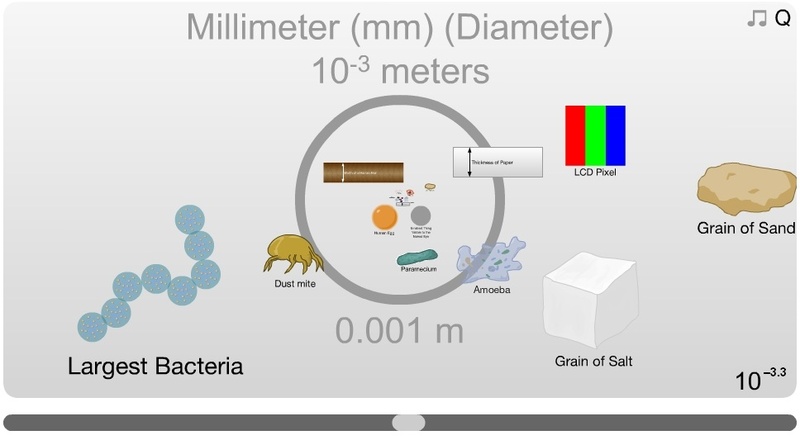 In minutes you can compare the size of a person to a bacteria and the united states to the moon, and our sun to the galaxy. There are many fantastic applications for this tool, but the one I used was this: Look at all the important things smaller than an inch. At some point fractions of an inch become too complicated and fail you. Miles are even worse. Try using miles to measure the distance to Alpha Centuri, our nearest star, and the numbers are truly astronomical. No, the metric system is shown to be useful because the same measurement is used for all of these things and it works. Give this website a spin. It’s a…humbling experience. But our friends across the pond have also made some fantastic educational resources that could add a lot to your classroom, provided that your students don’t giggle at the accents like my students did. Learn a language: The BBC provides lots of great language lesson for free, they make a great tool for students wanting to work on their own or as a supplement for an foreign language course. Learn to type: A great (but personally annoying; make sure your kids have headphones) website for learning to touch type, Dance Mat Typing teaches students to type using funny songs and typing lessons that work similar to Guitar Hero or Dance, Dance Revolution. Know the news: The BBC World Service is a national recognized source of quality journalism. They also produce a short, daily podcast that updates schoolchildren on world events. A great way to start the day and serve as a global current events. Bedtime stories: The BBC produces a great children’s program called CBeebies. Part of the show, called ‘The Bedtime Hour,’ involves acclaimed actors (including the 10th Doctor, David Tennant) reading bedtime stories in the manner of Reading Rainbow, but incredibly relaxing. Search YouTube for “CBeebies Bedtime Stories” to see these delightful clips.